The end of the year always comes as a surprise to me. It shouldn’t, but it does. I think that with Christmas and family and Santa and programs and projects, and, and, and …. my head is full and by the time that last week of December rolls around, I’m shocked. 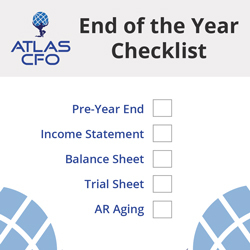 If you are anything like me, you want to be prepared, last year seems like a long time ago and you want to save yourself a bit of work in January when it is already hectic with filings and year-end reconciliations. Because of this, we’re are offering our checklist of the items we review/consider/discuss both before and after year-end. There are probably some of you that could add items and others that some of these items don’t apply, but hopefully it will help you during this time of year. Review your 1099 filings early so that you can gather any missing information. Some software allows for electronic filing if you have the subcontractor’s email.